It's finally back! A new hour-long episode, entitled The Delivery: Part 1 & 2, airs tonight at 9/8c on NBC. In Part 1, Pam’s contractions begin but she and Jim are determined to wait it out as long as possible so they can have more time at the hospital. Meanwhile the rest of the office tries to distract Pam from the pain with food and entertainment. 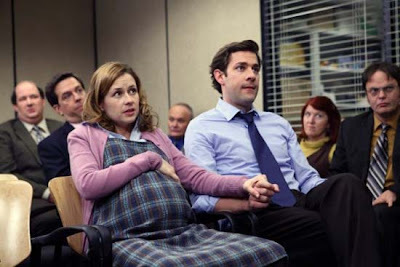 In Part 2, Michael anxiously waits for Pam and Jim’s baby to be born. Back at the office, Erin makes Andy jealous when she has lunch with Kevin. Part 1 was directed by Seth Gordon (The King of Kong) and Part 2 was directed by Harold Ramis. The Office is awesome and amazing. DVR set!